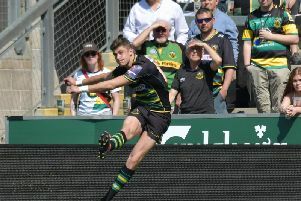 Saints welcome back Tom Wood and Kieran Brookes for Saturday’s derby date with Leicester Tigers - but Ben Foden and Kahn Fotuali’i have been added to the lengthy injury list. Foden was forced off with a groin injury at Saracens last weekend, while Fotuali’i is also ruled out. That means Tom Kessell will start at nine, with no scrum-half cover on the bench. Saints remain without Dylan Hartley and Lee Dickson due to concussion, while George North is still sidelined with a knee injury and Jamie Gibson is out with an ankle problem. Wood returns after missing the game at Saracens, and the England flanker will captain Saints. Brookes comes in for Hill, who is on the bench, while Ahsee Tuala returns from injury to take Foden’s place at full-back. Leicester have fewer injury worries and can boast a backline that contains the likes of Ben Youngs, Vereniki Goneva and Manu Tuilagi. Saints: Tuala; K Pisi, G Pisi, Burrell, Elliott; Myler, Kessell; A Waller, Haywood, Brookes; Craig, Day; Lawes, Wood (c), Harrison. Replacements: Marshall, Ma’afu, Hill, Matfield, Nutley, Hanrahan, Mallinder, Collins. Leicester: Tait; Veainu, Betham, Tuilagi, Goneva; Burns, B Youngs; Ayerza, Thacker, Cole; Barrow, Kitchener; Fitzgerald, O’Connor, McCaffrey. Replacements: Bateman, Mulipola, Balmain, Slater, Croft, Harrison, Williams, Thompstone.